Peter McLennan: Who Will Save the Planet? Who Will Save The Planet? (eBook version) is now available for free from Smashwords and some other sellers! Jason can’t work out how to get climate change fixed—until he saves the life of the mysterious and powerful Graham. Graham promises a reward, and Jason asks him to do something to stop climate change. The request is caught by the media, so Jason thinks the man’s trapped and has to keep his word. Who Will Save The Planet? is a young-adult novel of about 43,000 words (200 pages). Despite its theme, the story is not merely a thinly-veiled sermon on the evils of global warming—or on denial of same. It will appeal to readers who like to be given the opportunity to think, as Jason is forced to question his decision-making processes and the legitimacy of his stance. I’ve judiciously woven in some of the themes from my PhD-level research and practical work on dealing with uncertainty in long-range planning. This adds to the novelty of the story, and provides a few carefully-calibrated intellectual challenges. Despite the potentially dry subject matter, there’s a good amount of humour in the story. With its theme of emission control targets, the story is obviously topical. The pressure on governments to adopt and revise such targets will remain for as long as humankind has the population and technology to put pressure on the environment. The issue is of great—and perhaps greatest—concern to the younger generation, who will inherit the environment left for them while not having much influence over what’s done to it in the meantime. 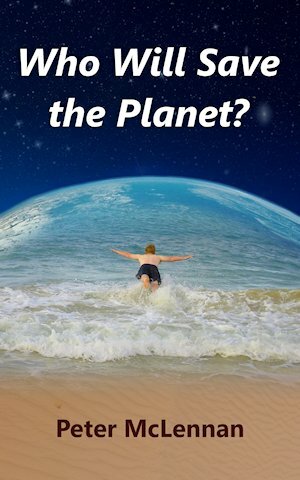 The sequel to Who Will Save The Planet? is Hacking the Mission. Get it now while it’s cheap!